Figure 1: Bottom: Structure of the planar cavity used for observation of the collective Lamb shift. Ultrathin layers of 57Fe were embedded in the centre of the cavity between two 16 nm thick carbon layers. X-rays were coupled evanescently under a grazing angle ϕ into the first-order guided mode to achieve maximum coupling of the nuclei to the radiation field. 2. Instituut voor Kern- en Stralingsfysica and INPAC, Katholieke Universiteit Leuven, Celestijnenlaan 200D, B-3001 Leuven, Belgium. 3. European Synchrotron Radiation Facility ESRF, B.P. 220, 38043 Grenoble Cedex, France. 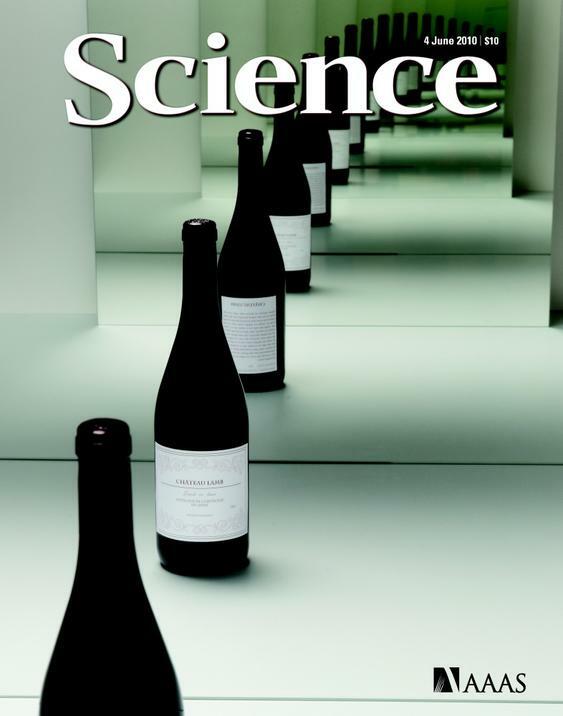 Published as: “Collective Lamb Shift in Single-Photon Superradiance”, Science 328, 1248 (2010). An atom, after being resonantly excited by a pulse of radiation, will typically de-excite with a characteristic decay time. An ensemble of many identical atoms with just one of the atoms being excited will decay much faster than a single atom. This is a cooperative effect in the interaction of light and matter known as superradiance. We have prepared a superradiant system by embedding an ultrathin layer of resonant 57Fe nuclei in a planar X-ray cavity. The collective spectral response of the nuclei in the cavity exhibits a frequency shift, the collective Lamb shift. Cooperative emission and the collective Lamb shift reveal interesting aspects of the many-body physics of photons and atoms. The interaction of many identical atoms with a common radiation field leads to a profound modification of the temporal, directional and spectral characteristics of their collective emission compared to that of a single atom. A prominent example is the phenomenon of superradiance that manifests as a strong acceleration of the collective spontaneous emission . A multitude of superradiant and other cooperative optical phenomena have then been studied in the regime of visible light, particularly after short-pulsed laser systems became available for time-resolved studies. Later it was predicted that the superradiant emission goes along with a radiative shift of the transition energy, the collective Lamb shift , which appeared to be extremely difficult to observe due to atom-atom interactions and multiple scattering effects. Here we explore the manifestation of superradiance in the regime of hard X-rays by employing the Mössbauer isotope 57Fe with a resonance energy of 14.4 keV and a natural linewidth of 4.7 neV. The technique described here does not only circumvent intrinsic problems of previous approaches, but also provides a very high spectral resolution to detect small energy shifts. The measurements were performed at beamline ID18 of the ESRF. To understand the collective Lamb shift, it is helpful to first look at the single-atom Lamb shift. The interaction of an atom with its own radiation field leads to a small shift of its transition, resulting from emission and reabsorption of virtual photons within the same atom, also known as the self-energy. The observation  and explanation  of this shift (for atomic hydrogen) paved the way for the development of quantum electrodynamics as unified theory of light-matter interaction. For his discovery, Willis E. Lamb received the Nobel Prize in physics in 1955. If the atom is now surrounded by an ensemble of identical atoms the emitted photon may be absorbed not only by the same atom but also by atoms within the ensemble. Considering the ensemble of identical atoms as a ‘giant’ atom, the emission and reabsorption of photons within the ensemble itself again leads to a (complex-valued) self-energy correction of the transition energy [4,5]. The real part of this quantity is the collective Lamb shift, the imaginary part the superradiant decay width. In order to prepare 57Fe atoms in a superradiant state they were embedded in a planar cavity (waveguide) and resonantly excited with pulses of synchrotron radiation coupled evanescently into the first-order guided mode (Fig. 1). The cavity geometry exhibits a number of important features that facilitate the observation of the collective Lamb shift. First, the ensemble appears to be optically thin upon absorption, and all nuclei in the ensemble are excited simultaneously. Second, the superposition of partial waves emitted from the nuclei in the cavity represents the emission from an optically thick sample (Fig. 1). Therefore, the optical thicknesses of the sample for absorption and emission are decoupled which is an important condition to obtain superradiant emission. The measured signal is the reflected radiation from the cavity resulting from the superposition of all partial waves Ai in Fig. 1. For a 1.2 nm thick 57Fe layer in the cavity one observes an exponential decay 60 times faster than the natural decay of individual 57Fe nuclei which is a clear signature of superradiant emission. 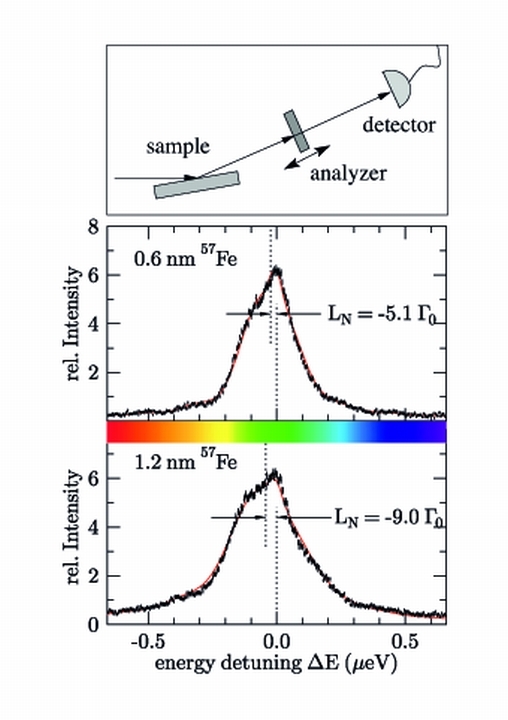 Spectral analysis of the reflected radiation was performed with a 57Fe single-line resonant analyzer foil mounted on a Doppler drive that is typically used in Mössbauer spectroscopy (Fig. 2). The transmission through the foil was recorded as function of Doppler shift. The resulting energy spectra for two samples containing 57Fe layers of 0.6 nm and 1.2 nm thickness are shown in Fig. 2. Both curves are much broader than the natural linewidth of Γ0 = 4.7 neV, reflecting the superradiant nature of the emission. One clearly observes spectral shifts of 5.1 Γ0 and 9.0 Γ0 of the centre of mass of the spectra towards lower energies. This is the collective Lamb shift. It approximately scales with the layer thickness of the 57Fe in both samples, as expected from theory. The measured data are in excellent agreement with calculations (solid red lines). The experiment has demonstrated a simple way to achieve Dicke superradiance in the X-ray regime. 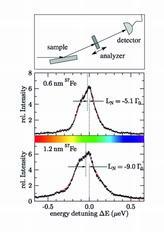 Mössbauer isotopes are almost ideal two-level systems to systematically explore cooperative effects in the light-matter interaction, and they offer a simple way to analyse spectral features with very high resolution. R. H. Dicke, "Coherence in spontaneous radiation processes", Phys. Rev. 93, 99 (1954). W. E. Lamb, Jr. and R. C. Retherford, "Fine structure of the hydrogen atom by a microwave method", Phys. Rev. 72, 241 (1947). H. A. Bethe, "The electromagnetic shift of energy levels", Phys. Rev. 72, 339 (1947). R. Friedberg, S. R. Hartmann, and J. T. Manassah, "Frequency shifts in emission and absorption by resonant systems of two-level atoms", Phys. Rep. C 7, 101 (1973). M. O. Scully, "Collective Lamb shift in single photon Dicke superradiance", Phys. Rev. Lett. 102, 143601 (2009).